Nigeria’s President, Dr. Goodluck Jonathan and the Governor of Bayelsa State, South-South Nigeria, Hon. Henry Seriake Dickson have been inducted as Fellows of the International Society of Comparative Education, Science and Technology (ISCEST). The induction was the highpoint of the Inaugural Conference of the Society which is currently holding in Yenagoa, Bayelsa State, Nigeria. The first edition of an academic journal produced by the ISCEST was also presented to the President at the forum. The 4-Day Conference, which opened on Monday, the 8th of December 2014 is being attended by participants from the United Kingdom, USA, Ukraine, Bulgaria, Ghana, France etc. Speaking at the event, President Jonathan commended the efforts of the members, particularly Professor Steve Azaiki of Nigeria, for the efforts at inaugurating the Society in Nigeria. The president who was represented by the Bayelsa State Governor, Hon. Seriake Dickson, reiterated his commitment to partner with individuals, organizations and corporate bodies with contributions to the development of the country. President Jonathan also stated that the establishment of the nine new universities in all the geo-political zones in the country was part of his resolve to put science and technology in its proper place in the nation’s technological development. On his part, Governor Seriake Dickson promised to donate a permanent secretariat to the Society as well as hosting the Annual Conference, noting that this will contribute to advancing the frontiers of science and technology education in the state. Governor Dickson also revealed that the state international airport and the Teachers Training Academy both of which are under construction, are pointers to the fact that the state is rising up to the challenges of developing its physical and human capacity. Also speaking, Nigeria’s former Minister of Science and Technology and Chairman of the occasion, Professor Turner Isoun noted that Africa is a continent with huge resources and capacities. Professor Isoun called on African leaders to join forces in order to solve the myriads of problems facing the continent such as unemployment, food shortage and insecurity. He also stated that the continent today has some shared values which must be protected by all and sundry, urging participants to utilise the knowledge gained at this conference for the benefit of the society at large. In his keynote address, Professor David Turner of the Faculty of Business and Society, University of South Wales, UK opined that ISCEST create a world network of opportunities which the internet itself has failed to do by bringing distinguished academicians and professionals from various backgrounds that will bring about innovations in science and technology in Nigeria. 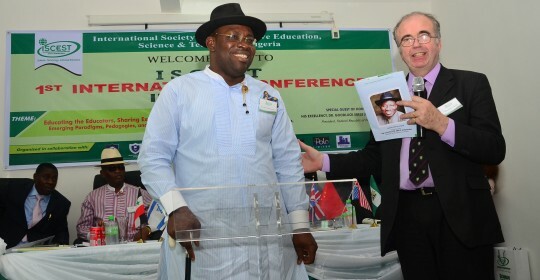 In his welcome address, the President of ISCEST Nigeria, Professor Steve Azaiki appreciated the tremendous support received from the Bayelsa State Government to host the conference, saying that it is the first of its kind in Sub-Saharan Africa. He thanked the President for his interest in the Society and also commended Governor Seriake Dickson for providing the enabling environment for the Conference to hold in the state. The Conference will be rounded off on Thursday, December 11, 2014, while the next Conference has been scheduled to hold from 6-12, December, 2015. ISCEST is a scholarly association dedicated to promoting Comparative Education, Science and Technology as well as advancing the academic status and values of these fields of human enterprise and endeavour. It has branches in the Americas, most of the countries in Europe and Asia. In Africa, the society has office only in South Africa. Nigeria is the second country in Africa to inaugurate the organization and to host an International Conference.